D-Link delivers another solid camera, but its app's emphasis on smart-home automation may limit its appeal. 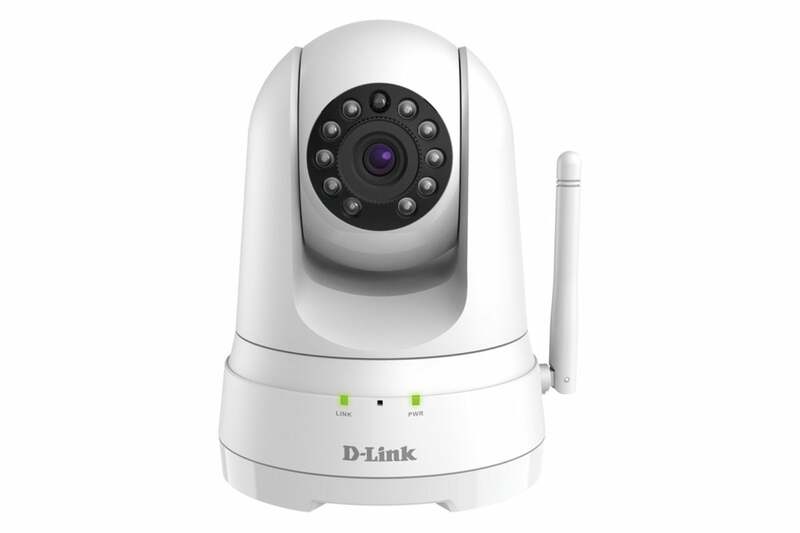 D-Link's Full HD Pan & Tilt Wi-Fi Camera (model DCS-8525LH) is the latest addition to the home networking company's growing stable of security cams. As we’ve come to expect from D-Link, this camera has a strong set of features, but is unfortunately hampered by an often overwhelming app experience. Design-wise, the DCS-8525LH is a clone of the DCS-5030L pan-and-tilt camera we evaluated a couple of years ago. And like that model, this one’s bulky body and conspicuous antenna won’t blend easily into your home unless your design scheme takes its cues from cold retro-future technology. For the most part, the specs also mirror that earlier pan-and-tilt model—a 114-degree field of view, 16-feet of night vision, 340 degrees of pan and 120 degrees of tilt, motion an audio detection—though the resolution takes a leap forward, maxing out at 1080p. It also adds integration with Google Assistant, Amazon Alexa, and IFTTT. The Full HD Pan & Tilt Wi-Fi Camera retains the look of the HD model. You can record video locally to a microSD card (not included) or to the cloud. D-Link gives you a rolling 24 hours of free storage with the camera’s purchase, but if you want more you can upgrade to one of three plans: Basic provides seven days of storage for three cameras for $2.50 per month ($25 per year if paid annually); Premium gives you 14 days of storage for up to five cameras for $5 per month/$50 per year; and Pro offers 30 days of storage for up to 10 cameras for $10 per month/$100 per year. I had the camera up and running within minutes out of the box. It’s just a matter of plugging it in and adding it to the mydlink app by scanning the QR code on the bottom. The app walks you the rest of the way to connect the camera to your home Wi-Fi network. Image quality is excellent, with balanced lighting in day mode and good contrast when night vision is activated. You can pinch to zoom with little loss in resolution to more closely scrutinize specific areas in the camera’s frame. The app logs all activity in an easy to sort timeline. You pan and tilt the camera by swiping or tapping on the screen—you can select your preference in the app settings. From the scroll wheel of controls under the live-feed pane, you can set up to four waypoints. These allow you view preset camera positions with a just a tap. The camera moved to the points smoothly and accurately in my testing. In addition to viewing the live feed on your phone, you can stream it to a bigger screen via Chromecast, Amazon Fire TV, Echo Show, or Echo Spot, while controlling the camera with Google Assistant or Amazon Alexa voice commands. The camera records video whenever it detects motion or audio above 75dB. You can adjust the motion detection sensitivity via a slider and set motion detection zones to minimize false alerts. Even without much tweaking, the camera reliably responded to people and pet activity while ignoring incidental movement, such as curtains rustling in the breeze of a fan. Scheduling is supported as well. 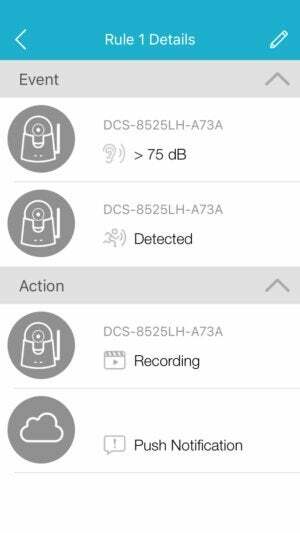 You can access event-detected videos stored in the cloud or on an SD card from a drop-down menu the camera’s home screen. Clips are stored chronologically by date and time. During playback, you can download clips to your mobile device. 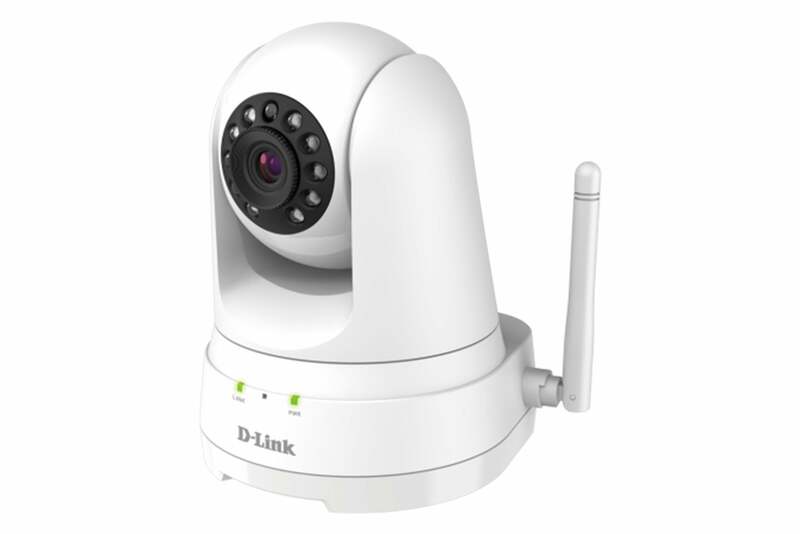 The DCS-8525LH uses the same mydlink app we first reviewed with the D-Link’s HD Wi-Fi Camera . While it has an attractive design, I was reminded of its many peccadilloes. The app was designed to provide a high degree of control and customizability. While that will undoubtedly be welcomed by smart-home enthusiasts, it can be pretty daunting for the average user who just wants a simple DIY security camera. The mydlink app requires you to create custom automations for features like motion detection. While the latter would do fine with a simple toggle for turning motion detection on and off, here they’ll have to go through a multi-step exercise to create an “automation”—an if-this-then-that-style recipe that tells the camera how to respond to particular triggers. For example: To get the camera to record video when it detects motion, I had to go to the Automation menu and create a new automation and give it a name. Then I had to create a “rule” by selecting an event—in this case motion detection, and an action—record video and push a notification. Once the rule was created and the automation saved, I had to return to the Automation menu and turn the automation on to activate it. Then I had to find my way back to the Account menu to turn on notifications so I could actually receive them. This level of customization will have its supporters. An automation can have a single rule, like the one in my example, or multiple ones for more complex tasks. 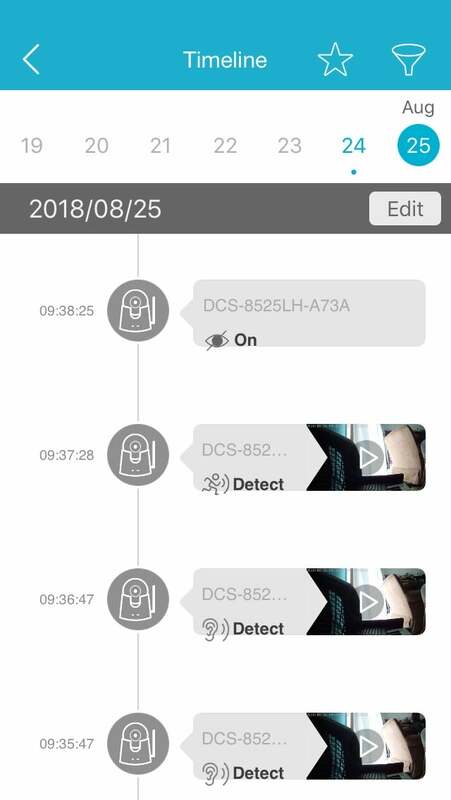 You can also create multiple automations to give you granular control over exactly when the camera is on and actively monitoring and when it’s not. But it’s not intuitive to figure out, and the app’s layers of menus can be a challenge to navigate. Users are advised to take advantage of the many tutorial videos accessible through the D-Link website. The DCS-8525LH’s improvements on the DCS-5030L should make it the go-to pan-and-tilt model in D-Link’s lineup for anyone monitoring more area than a fixed-angle camera can cover. But given the mydlink app’s new focus on smart-home customization, it also helps if you’ve had some experience with, and enthusiasm for, home automation tools. If like many security camera buyers, though, you’re looking for simplicity, you should check out some of the other top picks in our buying guide.